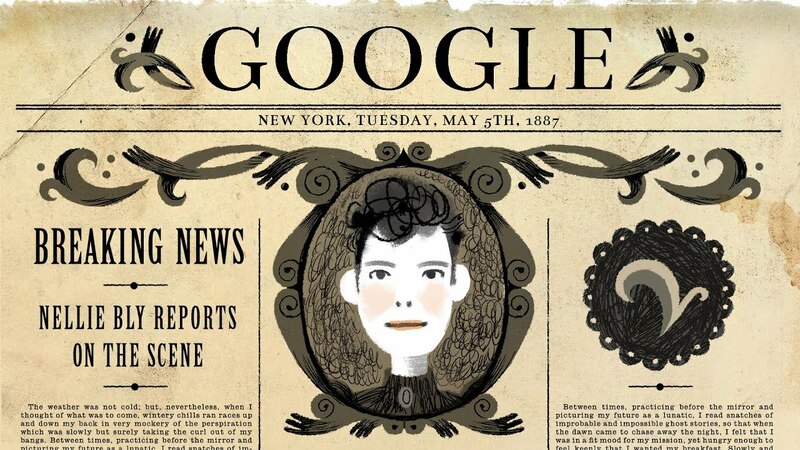 What Girls are Good For: Happy birthday Nellie Bly! In 1880, the Pittsburgh Dispatch published an article titled "What Girls Are Good For.” In dismissive terms, the column’s author wrote that women shouldn't be allowed to work because their place was at home. Days later, a pseudonymous rebuttal appeared in the paper. The response, by a 16-year-old girl whose real name was Elizabeth Jane Cochran, argued how important it was for women to be independent and self-reliant. Within a decade, the author of that response would become known worldwide as Nellie Bly: a hard-hitting young journalist who went undercover at a lunatic asylum and traveled around the world in a record-breaking 72 days. Throughout her life and career, Nellie Bly spoke up for the underprivileged, the helpless and minorities, and defied society’s expectations for women. We love her adventurous spirit, and we share her belief that women can do anything and be anything they want (we like to think if she were around today she’d be a fellow fan of trailblazing women like Ada, Anita and Ann). So when it came time to honor Nellie with a Doodle, we wanted to make it special. Karen O of the Yeah Yeah Yeahs wrote, composed and recorded an original song about Nellie, and Katy Wu, the artist who created this doodle, created an animation set to Karen O’s music celebrating this intrepid investigative reporter. Nellie was born on May 5, 1864 in a suburb of Pittsburgh, Pa. After her response was published in the Dispatch in 1880, the editor, George Madden, tracked her down and hired her as a reporter. At the time, women reporters commonly used pen names; hers came from a song by fellow Pittsburgher Stephen Foster. She spent several years at the paper before moving to New York for a job at New York World, which was owned by Joseph Pulitzer. In 1887, she went undercover at the Women's Lunatic Asylum on Blackwell's Island to write an exposé about the conditions there. Her resulting book, “Ten Days in a Mad-House,” made her famous. But Nellie is best known for her trip around the world. Inspired by Phileas Fogg, the hero of Jules Verne’s novel, “Around the World in 80 Days,” Nellie set sail from New York in November 1889 determined to beat Fogg’s time. Traveling by steamships and sailboats, she sent dispatches back to her newspaper as she circled the globe. Instead of sitting idly and just observing, she was always a part of the action and conversation, despite the fact that public spaces were typically reserved for men at the time. 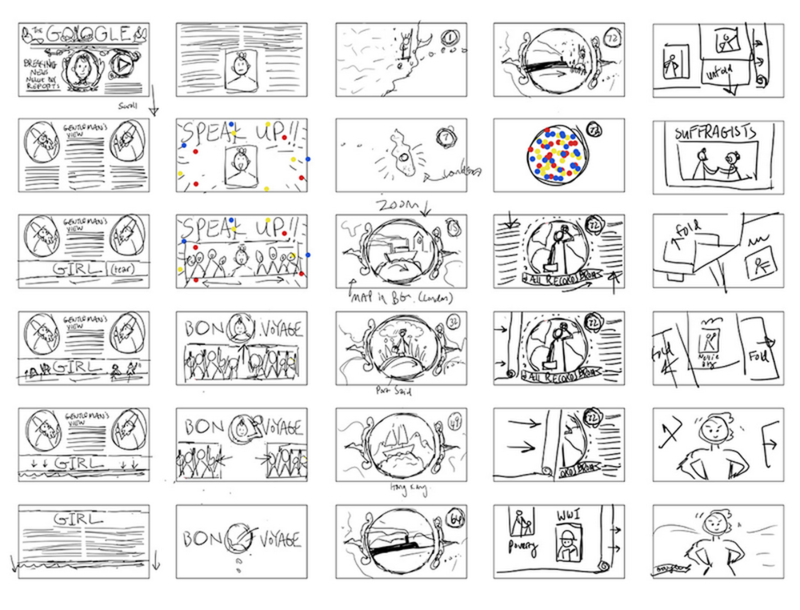 When creating the Doodle, we took inspiration from Karen O’s lyrics and Nellie’s journey around the globe. Throughout the video, Katy used newspaper as a unifying theme—with paper tearing, folding and crumpling as the story goes along. And though the video is mostly black and white, she added some color to represent Nellie's energy and vibrancy. Back in the 19th century, Nellie fearlessly showed a generation of people “what girls are good for.” We’re excited to tell her story in today’s Doodle—and we hope Nellie inspires women and girls everywhere to follow in her footsteps and show the world what they can do.